In this class you will have the opportunity to customize your very own bar necklace! You'll be able to choose from either a brass or sterling silver bar, and a variety of metal stamps to make your necklace both personal and unique! We'll give you tips and instruction for success so all students will leave with a finished necklace they are happy with along with a few new jewelry making skills! We'll be working with small components and tools, so please come prepared with glasses if needed for close up work. Choose from Brass $35.00 or Sterling Silver $50.00. Pre-registration is required, please sign up here or in person at the studio. Instructor Marisa Krol is the Artist/Designer/Ownerof Interstellar Love Craft Adornment and Co Founder of the collaborative teaching jewelry arts space, The Adorned Studios. She has been making and designing her own line of simple, geometric, soulful jewelry for nearly 10 years now under the ILC name. Her work has been featured in a number of local publications, retail outlets, and fine art & craft shows. Marisa was introduced to metal smithing by her early mentor, local silversmith, Sharon Jeter in 2009. She instantly felt she had found her calling and from there the Interstellar Love Craft brand was born. She enjoys making and designing her own work, but also felt called a few years back to share her passion for creativity with the local community. The Adorned Studios became an expression of this love, and serves as a collaborative teaching space/collective in Rochester, NY. Her classes are beginner level and "Make and Take" style. Within a couple hours time students will learn new skills, engage their creative side, and leave with a beautiful wearable project of their very own to keep or share! Marisa truly looks forward to taking the show on the road and teaching a whole new set of classes to creativity seekers here at ReFIND! Thank you for your interest in this workshop! Because we received no pre-registrations we have canceled this class. If you or your child is interested in this class, we would love to reschedule it, so please email Claudia at claudia@refindflx.com and let her know! THANK YOU! Did you know that Crayola markers are not just for drawing and coloring pictures, but can be used to create beautiful hand lettered quotes and watercolor projects? In this course, you will learn the basics of hand lettering using Crayola markers, practice hand lettering quotes as you master Crayola Calligraphy, and learn how to blend Crayola Markers as watercolors! Students will receive and be guided through a hand lettering workbook and complete a project of their choice. You will come away from this course with the inspiration and skills to create one of a kind, personalized projects for yourself, your family, and friends! Recommended for ages 7+, students need to have the skill of letter formation and grip/control of a writing utensil. Pre-registration required, please register online here or in person at the studio. Seats limited to 15 for this class. Melissa Smith is a full-time elementary teacher and part-time modern calligrapher and chalk artist who has been lettering since February of ‘17. She has previously taught Hand Lettering 101 at ReFIND and loves helping people become inspired to start hand lettering and continue on their hand lettering journey! Melissa lives in Canandaigua with her husband and their two cats. She loves to make and drink coffee beverages, read, hike, and letter with different mediums such as chalk, watercolor, brush pens, and on her iPad Pro. You can check out her artwork on Instagram and Facebook at @artfulfoxlettering and on her website www.artfulfoxlettering.com. Get ready for a slimly and bouncy good time! In this hour and half session, kids will roll up their sleeves and mix up two recipes: Fluffy Slime and Bouncy Balls! Aprons provided and clean up is on us! Kids will take home a container of slime and one bouncy ball. 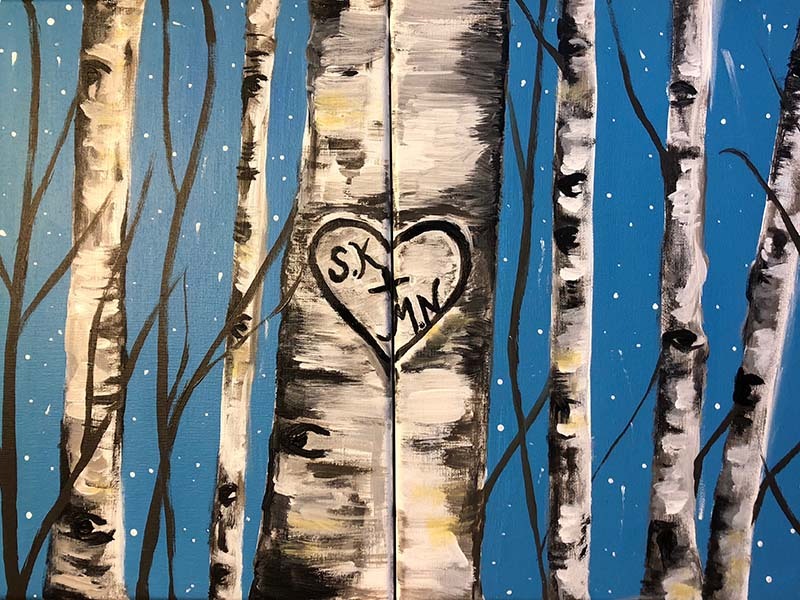 This class begins at 10:30am, you can add the early class (Paint Pouring) for a morning of fun! If parents choose to drop off their child, please come 10 mins early to complete a waiver and emergency contact form. This option is available for children 6 years and older. Parents are more than welcome to stay for the duration of the class, seating available along the side lines. Recommended for ages 3+. Pre-registration is recommended as we are limited to 10 seats for this workshop. Walk-ins available based on seats available. The Young Artist Workshops are instructed by Claudia Milroy, owner of the Studio and maker of art and craft projects. Her professional background is in architecture and graphic design but she has always enjoyed making art and crafting projects from an early age. As owner of the Studio, her goals are to bring art and crafts to our community in Penn Yan, to provide a safe and fun place for all ages, and inspire makers to create and find their passions through hands-on actives and experiences. In this artistic exploration of Paint Pouring, kids use tempera paints to create abstract art of their own! This class will begin as an instructed setting on how to measure the paint, mix paint and pour for both methods; the “flip-cup pour” and the “dirty pour”. 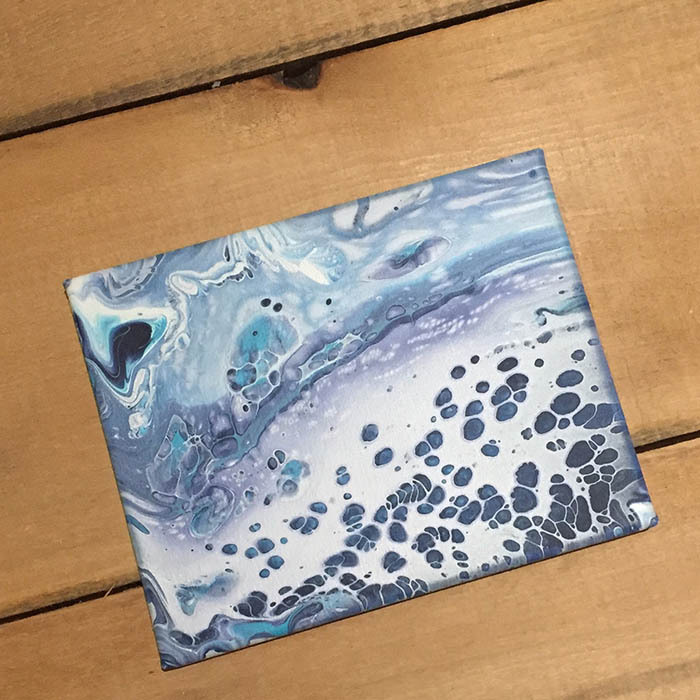 After the students practice these methods together on ceramic tiles, they create art using either method of their choice on a 8”x10” canvas panel. Students create two 4”x4” tiles and a 8”x10” canvas art. Art will need 24 hours to dry. We can package the art in disposable trays for transport or you can arrange to pick up at a later date. This class begins at 9am, you can add the next class (Slime Making and Bouncy Ball making) for a morning of fun! If parents choose to drop off their child, please come 10 mins early to complete a waiver and emergency contact form. This option is available for children 6 years and older. Parents are more than welcome to stay for the duration of the class, seating available along the side lines. Recommended for ages 6+. Pre-registration is recommended as we are limited to 10 seats for this workshop. Walk-ins available based on seats available. We will handpaint onto a pre-assembled sign measuring 12 x 5.5 inches. Background is white with a dark frame attached as shown in examples above. Sign will say “In a world where you can be anything, BE KIND”. PRE-REGISTRATION IS REQUIRED, purchase online here or stop in the studio to buy in person. 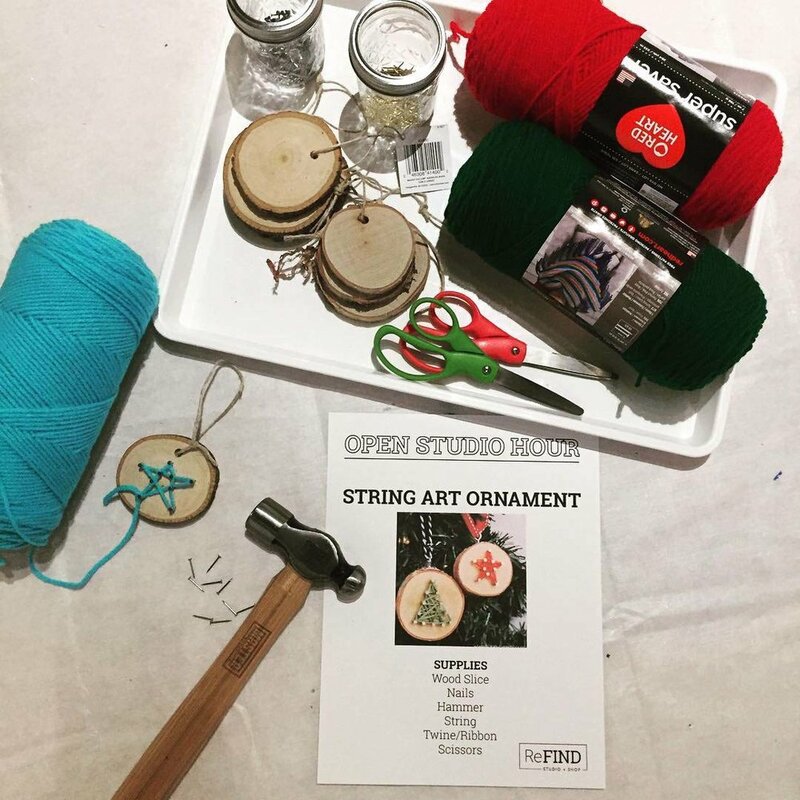 Open Studio is a self-guided art and craft time with full access to standard art/craft supplies, tools, and a rotating stock of specialty supplies. Art aprons available for all ages. A studio assistant will be on hand to answer questions and guide you. Inspiration projects for different age groups and interests will be available to get you inspired! The best part is, you come and make and we do the clean up! We accept walk-ins for Open Studio but now you can reserve your seat in advance! Add 4 or more seats and we will set up a private table for your group’s arrival! Kids make two kinds of bracelets and get to wear them home! We will begin with creating wood popsicle stick bracelets. Each student will make two wood cuffs, bending the popsicle stick into shape, then painting and applying embellishments to finish it off. The second bracelet will be exploring the art process of marbling. Each student will practice the marbling technique with paper cards and then dip a brass cuff to marble. All supplies included and students go home with 2 wood cuffs and 1 brass cuff. This class begins at 10:30am, you can add the earlier class (Dream Catcher Making) for a morning of fun! If parents choose to drop off their child, please come 10 mins early to complete a waiver and emergency contact form. This option is available for children 6 years and older. Parents are more than welcome to stay for the duration of the class, seating available along the side lines. Recommended for ages 4+. Pre-registration is recommended as we are limited to 10 seats for this workshop. Walk-ins available based on seats available. In Native American cultures, dream catchers are a sacred item and protect children when hung at their bed. The shape of the dreamcatcher is a circle because it represents the circle of life and how forces like the sun and moon travel each day and night across the sky. The dream catcher web catches the bad dreams during the night and dispose of them when the day comes. 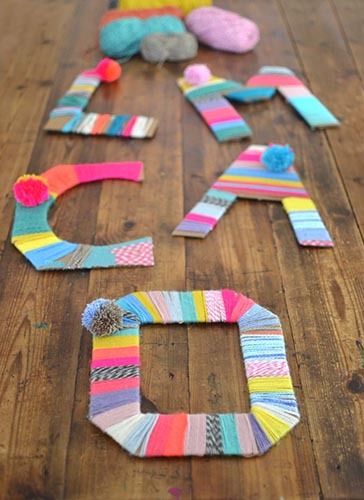 The first half of the class children will learn how to make Yarn Feathers and Yarn Pom Poms. With these handmade feathers and pom poms, children will craft their own dream catcher on a 6” wood hoop. A variety of additional craft supplies will be available from colorful yarns, feathers, beads and more. This class begins at 9:00am, you can add the next scheduled class (Bracelet Making) for a morning of fun! If parents choose to drop off their child, please come 10 mins early to complete a waiver and emergency contact form. This option is available for children 6 years and older. Parents are more than welcome to stay for the duration of the class, seating available along the side lines. 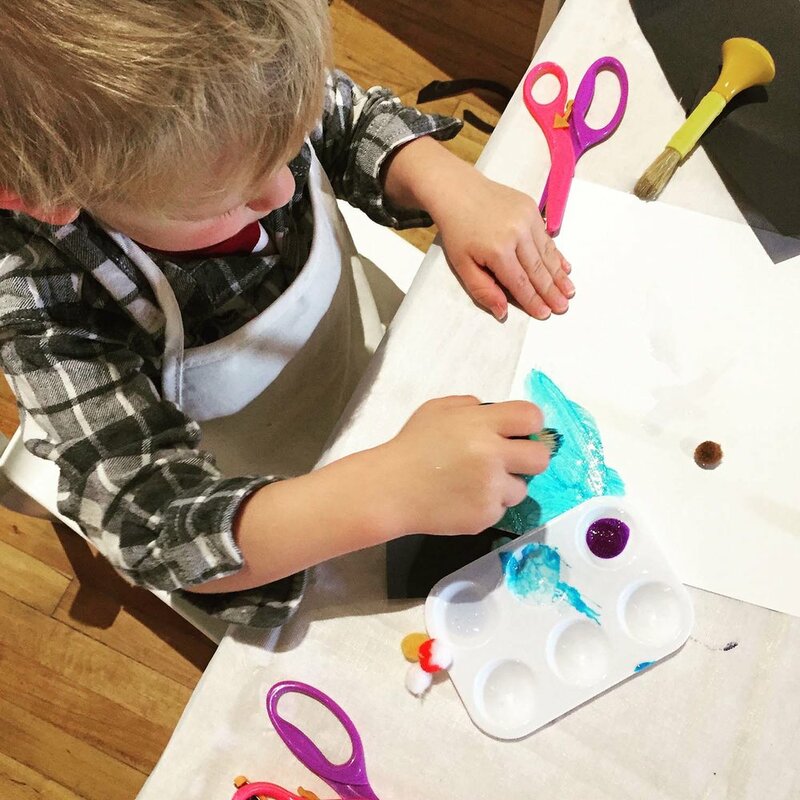 This mixed media workshop encourages kids to explore color and art in a non-traditional medium for a canvas, crayons and heat! 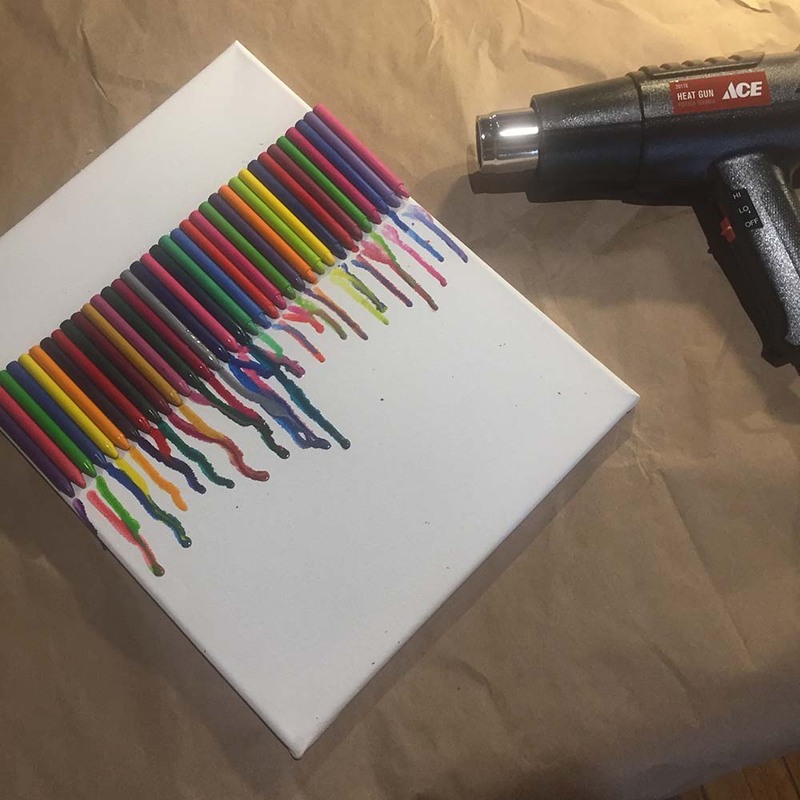 With a variety of crayons, students layout their canvas to make a unique art piece, assemble the canvas using hot glue and then use a heat gun to create the dripped wax effect. Students can personalize the top of the canvas with a color of their choice and hand letter their name or a word. Let’s get colorful and melt crayons! This class begins at 10:30am, you can add the earlier class (String and Nail Art) for a morning of fun! If parents choose to drop off their child, please come 10 mins early to complete a waiver and emergency contact form. This option is available for children 6 years and older. Parents are more than welcome to stay for the duration of the class, seating available along the side lines. Recommended for ages 6+, please note we will be using hot glue guns and heat guns. Pre-registration is recommended as we are limited to 10 seats for this workshop. Walk-ins available based on seats available. The Young Artist Workshops are instructed by Claudia Milroy, owner of the Studio and maker of art and craft projects. Her professional background is in architecture and graphic design but she has always enjoyed making art and crafting projects from an early age. As owner of the Studio, her goals are to bring art and crafts to our community in Penn Yan, to provide a safe and fun place for all ages, and inspire makers to create and find their passions through hands-on activities and experiences. 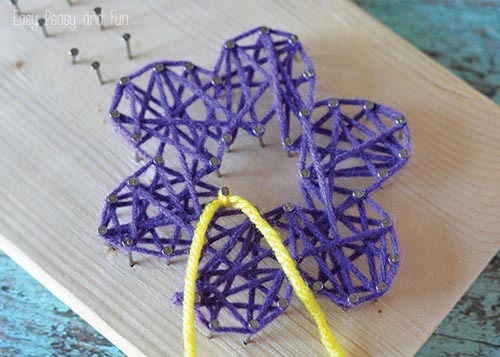 String art is a fun, expressive craft, students can use a template or create their own. There's no limit to what you can create when you set your mind to it! We will begin the class with an overview of the steps to make an eye-catching piece of wall art. Wood pieces are approximately 6” x 6”, and if time allows kids can make more than one. 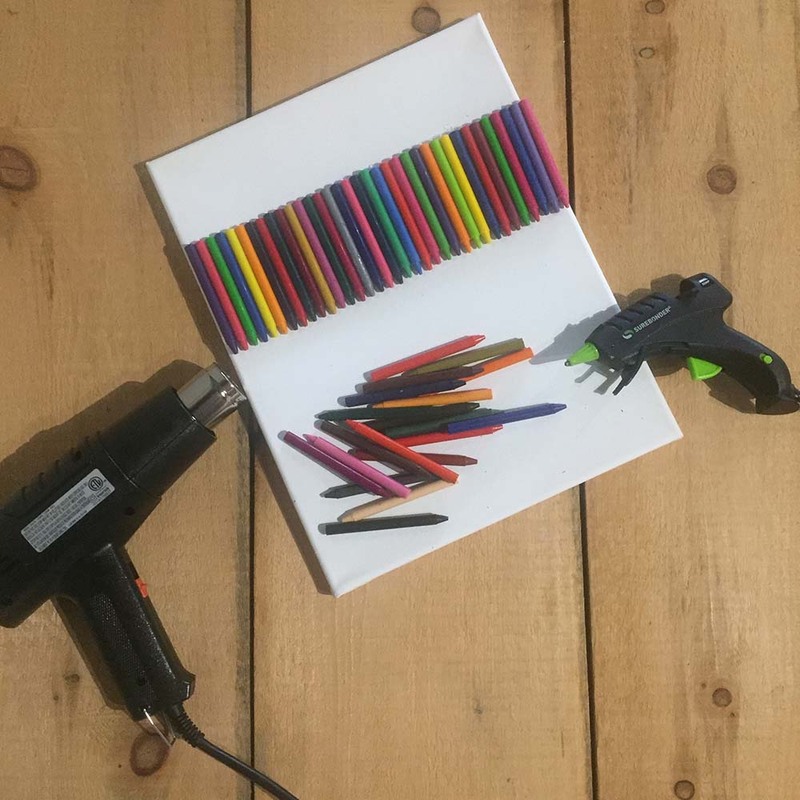 After choosing a design, you hammer in the nails, we have little hammers and nail starters to use, and then you connect the nail heads with your choice of colorful yarns and strings. Let’s create! This class begins at 9:00am, you can add the next scheduled class (Melted Crayon Art) for a morning of fun! If parents choose to drop off their child, please come 10 mins early to complete a waiver and emergency contact form. This option is available for children 6 years and older. Parents are more than welcome to stay for the duration of the class, seating available along the side lines. This is a great class for beginners, for children ages 13 and older, as well as the experienced crotchetier to learn a new pattern. Pre-registration is recommended to reserve a seat. Walk-ins are welcome if seats and supplies are available. Kelley Reynolds is native to Penn Yan and a volunteer at Milly’s Pantry. She has been crocheting for years and loves to spend her time making handmade crocheted gifts for others. 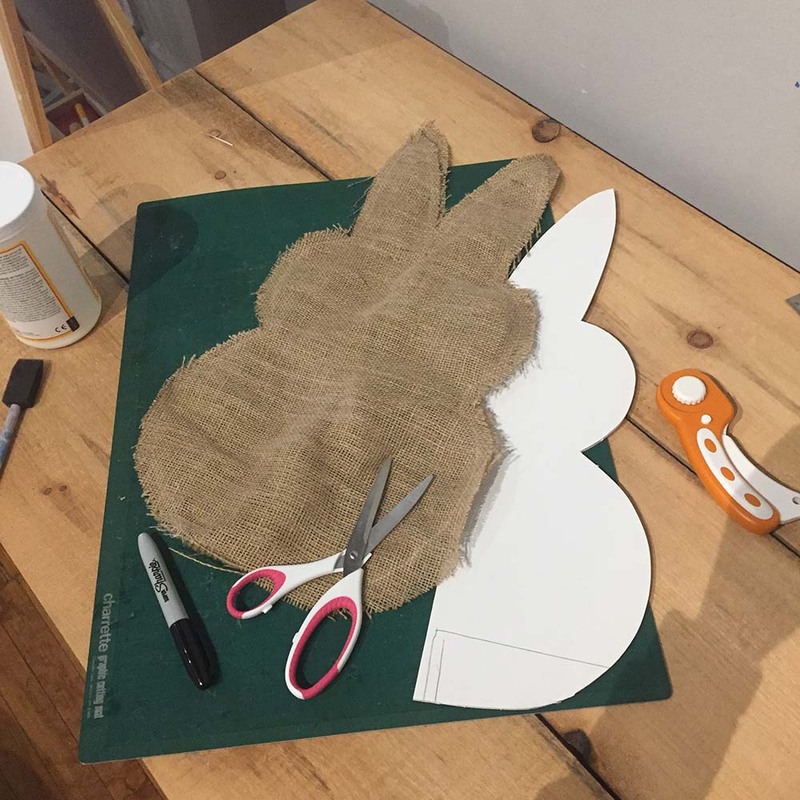 Using burlap, yarn and ribbon, together we will create this adorable bunny, tail and all! You will learn how to cut burlap and get tips on how to minimize the fraying when working with burlap. How to make the bunny tail pom-pom and a simple wire ribbon bow will also be instructed in this class. We will work together step by step, all supplies are included. Recommended for ages 13+. Pre-registration is recommended to reserve your seat, walk-ins accepted based on availability of seats/supplies. Instructed by Studio Owner and Maker, Claudia Milroy. Her passion for art and design extends to home decorating and crafting for her own home. She loves to explore different mediums and using natural elements. Have you ever seen hand-lettered signs at weddings, showers, and home decor stores and wanted to learn how to make them yourself, but didn’t know where to start? Well, now you can! In this class, we will learn the basics of understanding letter forms, lettering with brush pens, and how to form each letter to create beautiful hand-lettered pieces of art to share with your family and friends! Students will go home with two of my favorite brush pens and a work book containing basic strokes, two alphabets to get you started, tips and tricks, and a supply guide to further you hand lettering skills! Recommended for ages 12+ (parent must be present during class with children under 18). PRE-REGISTRATION IS REQUIRED, purchase the class here online or stop in the studio to buy in person. 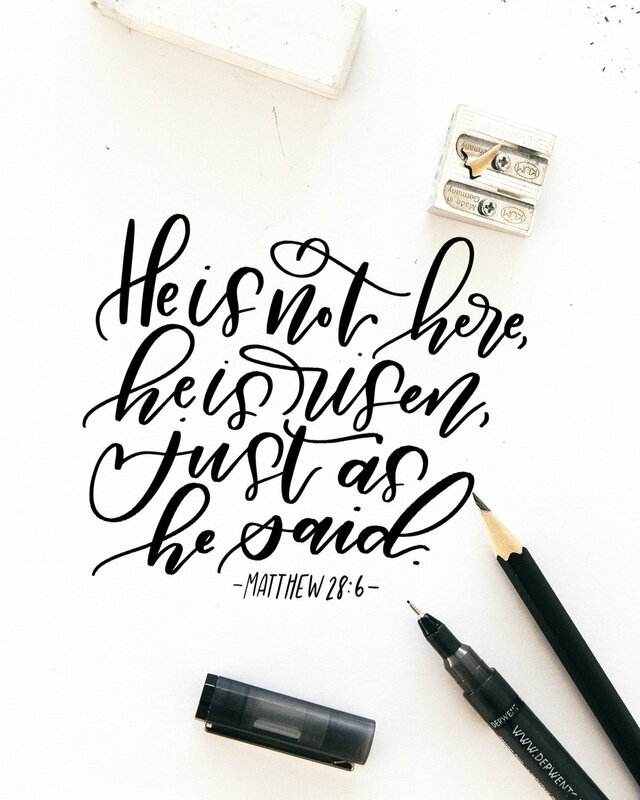 Melissa Smith is a full-time elementary teacher and part-time modern calligrapher and chalk artist who has been lettering since February of ‘17. She is mostly self-taught and has completed Amanda Arneill’s Lettering Masterclass. Melissa lives in Canandaigua with her husband and their two cats. She loves to make and drink coffee beverages, read, hike, and letter with different mediums such as chalk, watercolor, brush pens, and on her iPad Pro. You can check out her artwork on Instagram and Facebook at @artfulfoxlettering and on her website www.artfulfoxlettering.com. This class is an introduction to the art fly tying. An overview of the equipment and materials will be covered. 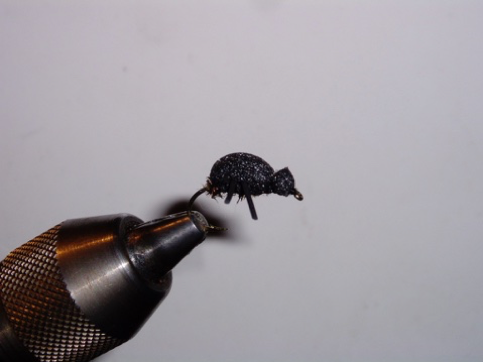 Different flies will be taught that incorporate basic techniques used to tie a wide variety of flies. $40 per adult or $30 per child (between the ages 10- 19) or $60 combined adult and child. Cost includes the use fly tying vice, tools, and materials to tie the flies taught during class. Shahab Farzanegan has worked in the field of aquatic and angling education for the last 20 years and untill recently was Aquatic and Angling Education Coordinator for the Oregon Department of Fish and Wildlife. He has also served as the Director of the Community Fly Fisher in Ithaca NY and Coordinator of the National 4-H Sportfishing Programs. Shahab has written many fly fishing educational resources, served as a New York State fishing guide and instructor of fly fishing at Cornell University. Shahab currently lives in Glenora on Seneca Lake NY. 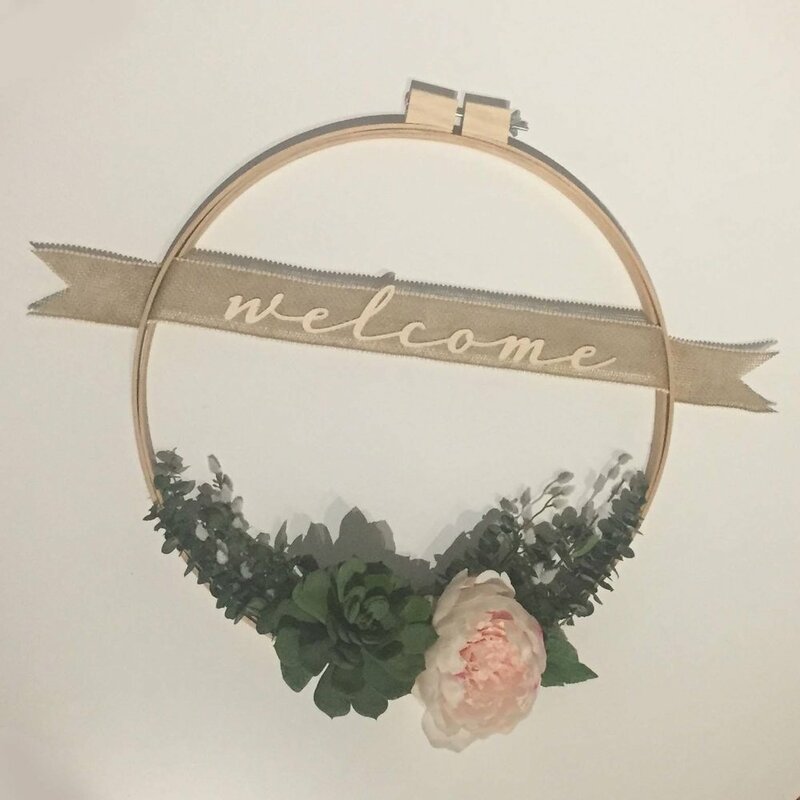 With an 18” diameter embroidery hoop, we will make a spring inspired wreath using realistic silk flowers, faux succulents, dried and faux greenery, burlap ribbon and wood letters. All supplies included to make one wreath are shown in image and includes the word welcome. This wreath is designed to easily interchange the ribbon and words to keep the wreath updatable throughout spring. For an additional fee of $10 you can go home with another ribbon celebrating “spring” or “happy easter”. This is purchasable in class, supplies limited and first come/first serve. Instructed by Studio Owner and Maker, Claudia Milroy. Her passion for art and design extends to home decorating and crafting for her own home. She loves to explore different mediums and loves the combinations of non-traditional elements on this wreath - from the faux succulent to wood hoop and the combination of wood letters and ribbon. Join us for Open Studio Hour and make colorful wall art. Select from a variety of wood pieces and templates, hammer the nails in and connect the dots with colorful string! All supplies included and you take home the art you create! Time to complete varies depending on the template. Plan for at least 20 mins up to 1 hour. We ask parents/caregivers to help their younger children to hammer the nails in. A studio assistant will be available but limited upon how busy the studio is. In this instructed class, children will explore watercolors and techniques including painting with salt for a 3D effect! By the end of the class, children will have watercolored a winter scene of trees and snow. No experience required, we just ask that your child is old enough to listen to instructions and be open minded. Recommended for ages 6-18, but this class is not limited to that age group. Younger children will need a parents/caregivers assistance. Class is open to 12 students total (plus their parent/caregiver), register early to reserve your spot. We will will accept walk-ins based on availability. 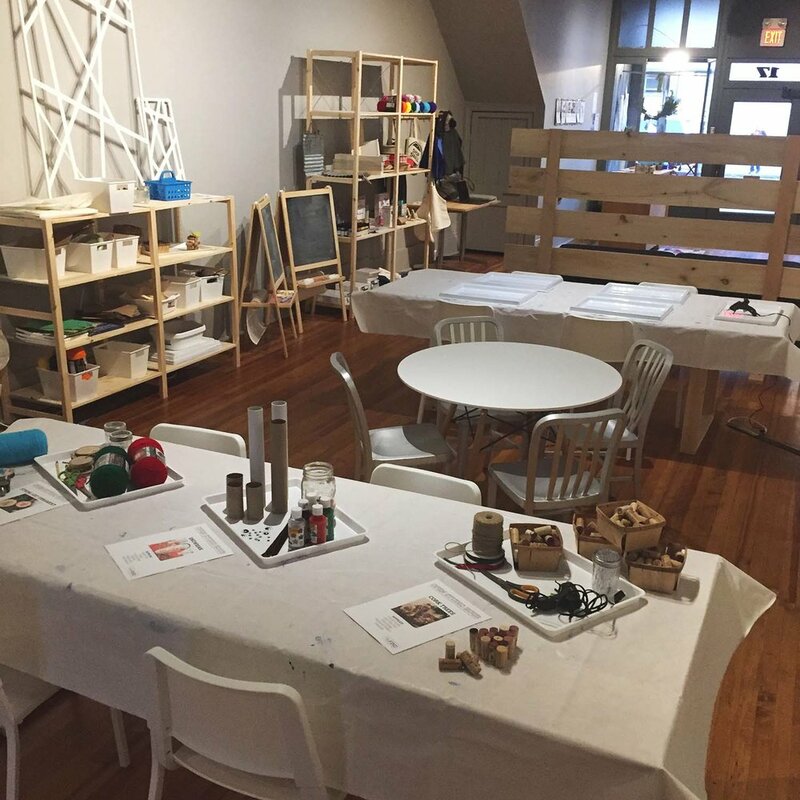 Explore art and your child’s inner artistic self at this fun interactive class. As a class we will trace each child’s outline on paper to create a full size silhouette. Your child will then explore using paint, markers, yarn, glitter and more to create their self-portrait, reflecting who they are! A studio assistant is available to help but we always encourage parents and caregivers to assist and explore with the kids. Examples will be hung to inspire children on how to use the art and craft supplies. Recommended for ages 6-15, but this class is not limited to that age group. See our calendar for our ages 2-5 yr old class. If you have children that bridge the two classes, we recommend inviting the older child to the younger group. Trace your child’s outline on paper and let your child paint, color, glue and glitter their self-portrait, reflecting who they are! Children, ages 2-5, will need your assistance to create and explore their inner artistic self. Examples will be hung to inspire children on how to use the art and craft supplies. Recommended for ages 2-5, but this class is not limited to that age group. See our calendar for our ages 6-15 yr old class for our older young artists. If you have children that bridge the two classes, we recommend inviting the older child to the younger group. ELEVATE Youth collaborates with ReFIND for a LOVELY time! Make a marbled clay heart keychain, in your choice of colors, and a heart shaped bird seed hanger. Event is FREE for Kids under 18 years old. Come anytime between 10am and Noon. We are able to accommodate 20 children every 30 mins. Crafts will take approximately 20-30 mins to make both. If a line forms we will create a waiting list. The marbling paint takes 20 mins to dry, children will start with this craft and then make the bird seed hanger. The bird seed hanger needs to be taken home and refrigerated over night for it to harden. It will be made on a cardboard square and wrapped with plastic for easy transport. Great for all ages and FREE for all kids under 18 years old. Seating is available on the side lines for parents and caregivers. We encourage you to join in on the fun and help the kids craft. Younger than 4 years old will need Parent’s assistance. 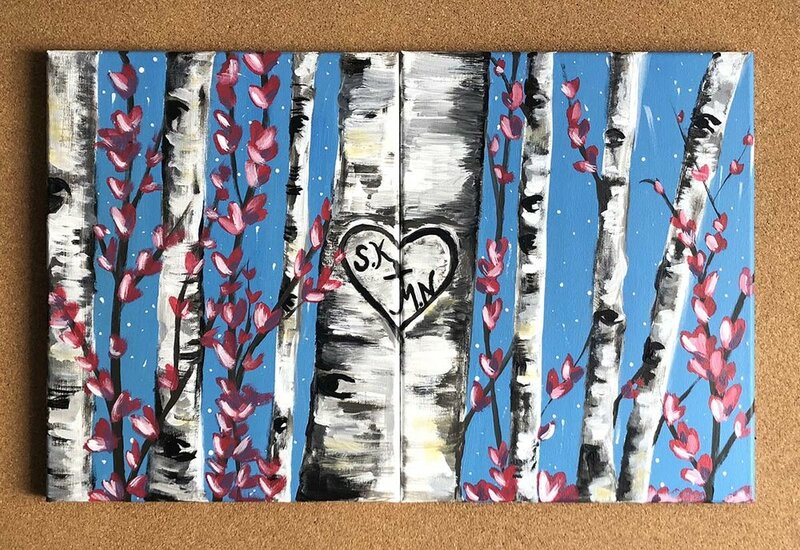 Join us for a night of creating Valentine home decor and gifts. 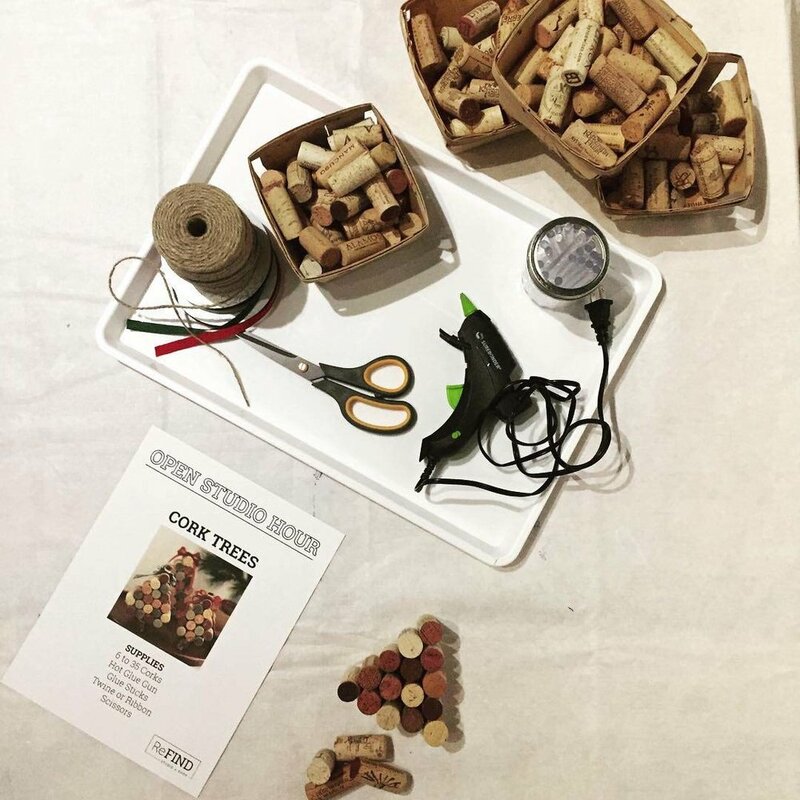 While you create, sip on some locally crafted wine or beer. Valentine Door Wreath: $20 - includes brass hoop, faux flowers, wood slices, ribbon and supplies to embellish and attach pieces. Personal instruction and guidance included. Custom 8” x 8” Photo Transfer on Plywood - bring your own digital file of the image on usb, or email at claudia@refindflx.com, to customize photo (no additional charge to customize): $20 - includes printing of image, 8”x8” plywood substrate, mod podge and instructions. This craft takes 24 hours for the transfer to complete, take the the project home and let it cure over night for it to set. At home instructions to complete project will be provided. Yarn Valentine Garland: $10 - includes heart foams, yarn and and instructions to create a 5 piece garland in red, white and pink yarn combinations. Custom Valentine Day Sign on 16” x 6” x 2” Plywood Sign: $35 (Not pictured here) You choose the saying and font selection. Then use our Cricut Machine to customize a stencil to paint your own plywood sign. Assistance available to personalize the sign and print the stencil. Marbled Handmade Card for that custom and personalized gift: $5 (Not pictured here) Choose from over 20 colors to personalize a 5”x7” bi-fold card to make that perfect Valentine’s Day card. Complete the form and let us know you will be making! We will only be taking walk-ins, supplies are limited and available on a first come, first serve, but with your completed form you are reserved for a craft of your choice! With a complete form, pay at check in and get a buy one craft get a second craft at half price! We will charge full price for the most expensive craft you purchase, then half off the second craft. All beer and wine tastings are free and provided by the wineries and breweries. Must be 21+ for the wine and beer tasting. Your most expensive craft will be charge at full price, second most expensive craft will be charged half of.